Have you ever sat down to work on a blog post and found the spark just wasn’t there? If writing doesn’t come naturally to you (and even if it does), any excuse can be enough to push blogging to the back burner. But then your website loses steam, you lose confidence and momentum, and worst of all the people who need you and your wisdom lose out completely and you don’t get to help them. Now you may be wondering, isn’t my blog supposed to be all about the reader, and not about me? What does my passion have to do with it? When you write from a place of passion, you cannot fail to connect with your perfect audience. They will feel your genuine commitment to helping them solve this particular health problem, and they’ll get to hear your authentic voice as you speak from your heart to their heart. Only your perfect clients will resonate with your message and how you write it – ideally, the exact same way you speak it when they’re with you in the room or over the phone. Maybe it’s time to scrap this post and move on, maybe you can’t reconnect to the spark you had when you first thought of the topic, or maybe the problem is that the spark was never there in the first place. It’s a sub-topic you’re not particularly excited about, even though it’s a core issue for your audience and very connected to your passion area. Try this: Keep your eyes on the prize – if you can get someone over this initial hurdle, they can move into a place where you can both focus on what you love. Meet the person where they are to get them where they need to be. It’s a sub-topic you don’t know as much about. We can’t be experts at everything. Try this: Collaborate with other experts and either quote them as a trusted source in your blog post or share something they’ve already written. You can also enhance your own practice by immersing yourself in the latest research to learn as much as you can. It’s not a post you should be writing. Maybe you’ve strayed from your core categories, or you’re delving into a topic that’s better suited to your diary. Try this: Head back to your blogging plan and get reacquainted with your original passion for your audience and the issues they care about, and most importantly how your blog will help them solve those problems. You’re passionate about your topic, but you (and others) have already written about it many times. Feel like there’s no use saying it all again? Try this: Realize that today’s reader may have never seen your older posts about the topic. If this is still an important concern for your audience, freshen up your older posts and give them new life. As far as your fellow bloggers, remember what I said earlier about your perfect clients. Even if they’ve read similar blog posts from someone else, it is your message that will draw them in and turn on that light bulb above their head. You’re passionate about your topic, but not about writing. I hear this all the time from wellness professionals who love what they do but struggle with the online marketing required to attract more clients and grow their business. Try this: Seek a blogging coach or mentor to light your spark and give you the tools, confidence and know-how to let your passion shine through your writing. You can start by joining my next free online blogging workshop! 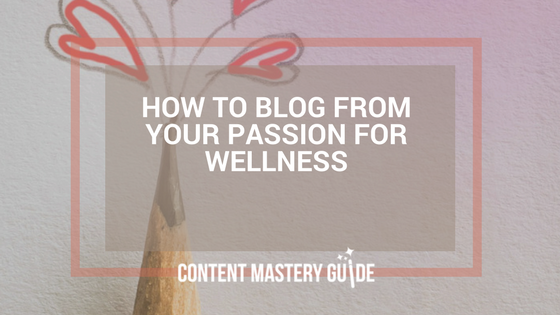 Passion is one of the most important ingredients of an effective wellness blog. Use these tips and suggestions to boost your passion so your readers can feel it leaping off the page.